It’s been less than a year since Toronto’s Impact Kitchen first opened its doors, yet it’s already made great strides in offering some of the city’s cleanest eats. Co-owner and personal trainer Josh Broun emphasizes minimally processed, nutrient-rich food. Although much of the menu is a godsend to paleo advocates and those with allergies or food sensitivities, like gluten or dairy, there are options for everyone. With plenty of seating, both in their dining area and as part of their smoothie/coffee bar, the interior is spacious with a modern-industrial feel. Rustic wood tables and large steel pendant lamps are offset with playful touches — like the customized surfboards mounted on the wall and a friendly display of fresh produce. The space has a decidedly approachable west-coast vibe, combined with the urban-chic camaraderie of Toronto. If athleisure was a restaurant, this would be it. But if the atmosphere isn’t enough to make you want to set up shop, sip on a brain-fuelling butter coffee ($4.42) and get some work done — just wait until you try the food. On the breakfast menu, you can find some of the more standard options, like steel-cut oats ($5.95), chia pudding ($5.95), and smoothie bowls packed full of superfoods, like coconut butter and bee pollen. If you’re in the mood for something savoury, try the Power breakfast bowl ($9.95), featuring fluffy scrambled eggs and crispy chorizo served on a bed of spinach with sweet potato and squash mash, avocado, and salsa. It’s the perfect balance of protein, complex carbohydrates, and healthy fats that will keep you satiated and feeling energized. 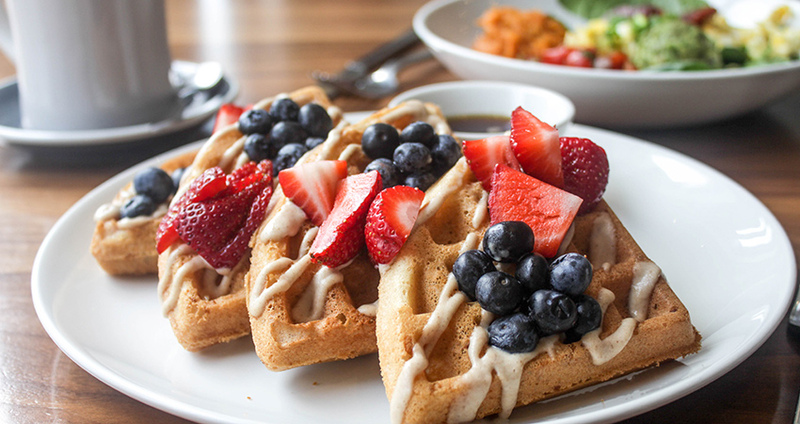 For something more indulgent, try the Paleo waffles served with cashew cream and maple syrup ($9.95). They’re crispy and taste like those vanilla wafers grandma used to serve, except without all of the guilt — they’re part of the brunch menu, which is served on weekends until 12:30pm. The Asian Rainbow Slaw ($14.95) and The Warrior ($12.95). 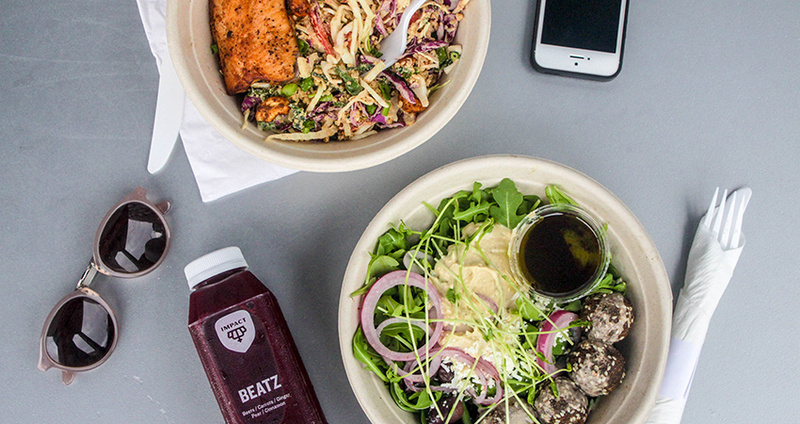 For lunch and dinner, there are an array of different salads and power bowls. The Warrior ($12.95) takes steamed rice and tops it with plenty of fresh arugula and micro greens, pickled onions, black olives, feta, fresh mint and basil, and a schlop of hummus. The falafel balls are a great plant-based protein to add to this bowl — unlike their fried counterparts, these falafel balls are dehydrated (super perfect for any raw foodies out there). The Asian Rainbow Slaw ($14.95) combines shredded cabbage and bell peppers with kale, quinoa, cashews, and green onions in a sweet and creamy vinaigrette. For some extra protein, try it with the blackened trout (+$3), which is seasoned and cooked to perfection. Other popular items are the Maverick ($12.95), which includes a root vegetable mash with broccoli, sprouts, salsa, avocado, and pesto; and the Zesty Mexican ($14.95), Impact Kitchen’s healthier take on a taco salad with raw mole tortilla crackers and vegan sour cream. 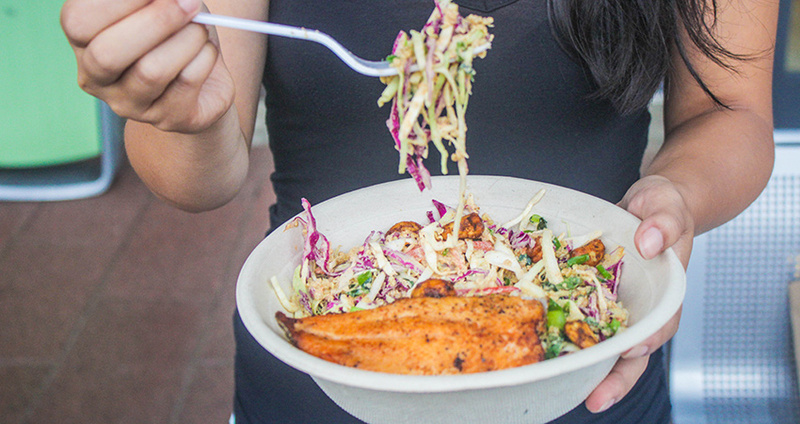 For some extra protein, try the Asian Rainbow Slaw with the blackened trout (+$3). Broun informed me that they are already looking to open a second location, possibly in a neighbourhood that’s near and dear to my heart, so stay tuned for another Impact coming possibly near you.